Most people would agree (and we certainly do!) that a good quality baby carrier is a must when your children are small. It gives you so much versatility in the way that you get around with your baby or toddler, and means that you aren’t restricted in small spaces, on public transport or when you just need to have your hands free. Of course, there are a huge number of baby carriers, slings and wraps on the market and it can all get a bit overwhelming. What if you just want one, great carrier that does it all? Does such a thing even exist? Yes, it does. If you are something of a baby wearing aficionado, you might be aghast at the idea of limiting yourself to just one carrier, but even the aficionados have their favourites! The Ergobaby brand has been high on our list of great carriers for a long time, but the release of the Ergobaby Four Position 360 Carrier rockets them to the top of the list. What’s so great about it? Comfort and versatility. Not many people find a discussion of ergonomics particularly interesting in daily life, but you’ll only need to get one decent backache from carrying around a growing baby before it starts to loom large in your thinking. And ergonomics is where the Ergobaby 360 Carrier is really ahead of the pack. The carrier has been designed in close consultation with experts in the field, to ensure that it’s a comfortable and safe ride not just for parents, but for babies as well. Your baby’s spine, head and hips are all supported just where they need to be, and at the same time, the design of the carrier spreads baby’s weight out evenly so that you stay safe and comfortable too. Ergobaby even have plenty of expert testimonials to put your mind at rest. In terms of versatility, the Ergobaby 360 Carrier is versatile for both baby and adult – it will fit comfortably whether you’re very short or very tall. You can adjust both the width of the waistband and the length of the carrier on your body, so you can wear it comfortably from birth, even if you’re recovering from a caesarean. What’s more, it’s bound to suit however your baby likes to be carried, because it can do even more than you can with your arms alone. Ergobaby’s Four Position 360 Carrier gets its name from all the positions you can use it in – hip carry, back carry, front facing inwards and, when your baby is old enough, front facing outwards too. 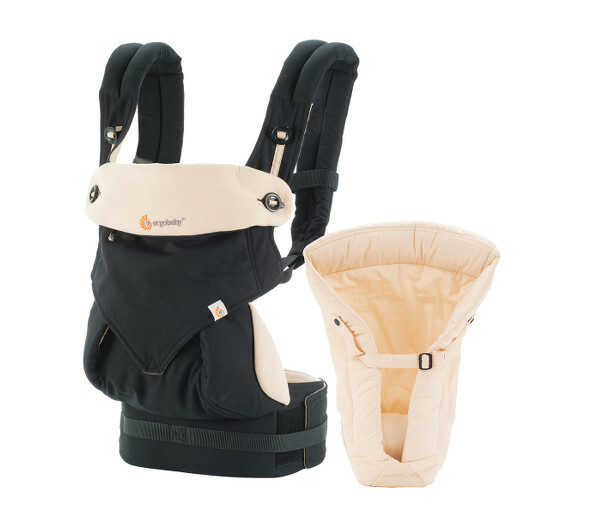 Now, as well as all these options, Ergobaby have released the Four Position 360 carrier together with the newborn Infant Insert in a package that they call the Bundle of Joy. This great package has only become available this month. It makes the carrier even more versatile, because it means it can carry most babies from birth. You can check out all the specs on the carrier at Ergobaby, and you can pick it up from baby wearing experts Babes in Arms. Prices begin at $229 for the Ergobaby 360 Carrier alone, with an extra $20 for the Bundle of Joy package.